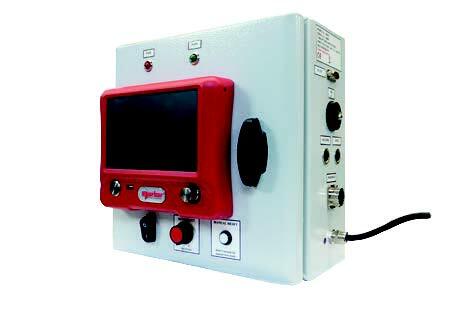 The Tool Controller Shut Off System is supplied in a wall box for “External Control” versions of the Norbar PTM series of tools. This can give a much greater range of functionality than is possible on the “Internal Control” version of the tool. The backlit display shows an accurate reading of the torque applied and the settings for the tool controller. The Tool Controller has 12 sets of limits to control the power tool shut-off. each limit has a target value and upper and lower allowances. When the lower allowance is reached the power tool is shut-off. The limit status is shown as LO/OK/HI on the display and with bright LED’s to show “PASS” or “FAIL”. A serial port is provided for data output to a computer or printer. Options include sending limit status, time and date. *Tool Controllers are supplied without leads. *Other lead lengths can be ordered at an additional cost. Both 61126.600 and 61128.600 are required to control a PT Series tool with a tool controller. *The models above are a sample of the Controllers that Norbar produce. Please contact Norbar for your special requirements.